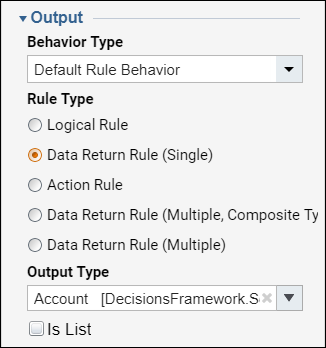 Rule Steps	can be configured to return data objects rather than simple outcomes. 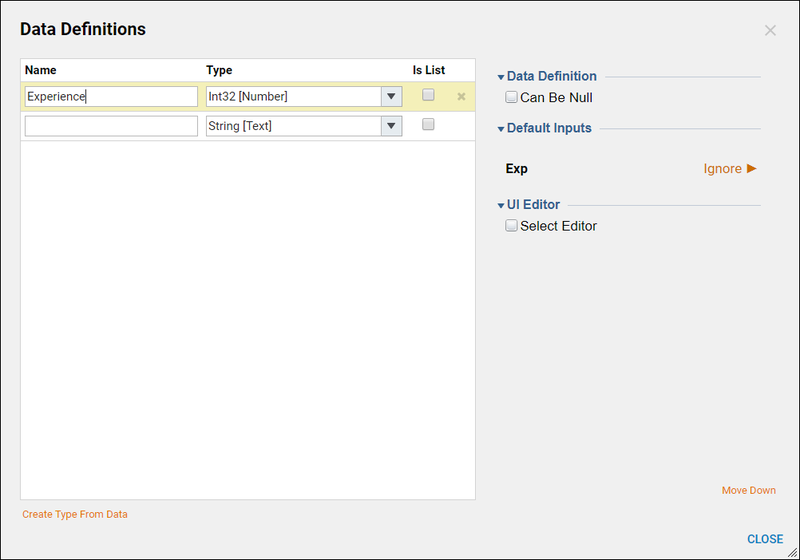 For example, you can create a rule that outputs an account object or a folder. In the Properties	panel of the Rule Designer , in the Flow Data	section, next to the Flow Input Data	box, click the Add	button to open a form for defining that rule&apos;s output as the individual type or list of your choosing. To create a data outcome rather than multiple path outcomes, in the Properties	panel, in the Output	section, in theRule Type	drop-down list, select Data Return Rule	. Map that output to a form&apos;s input using theMapping Editor. Begin by creating a flow within a Designer Folder, within that flow add a Run Rule	Step. Name the new rule and select Create. When the Rule Designer opens select Setup Input Data. On the Data Definitions	Dialog define an Int32 then select close. From the Select Data Element	drop down select Experience. Pick Greater Than	as the verb. For the value type 3 as the constant. Save and Close the rule designer. Debug the flow containing the rule. Type 4 has the Experience input, then run the debugger. The debugger shows that the rule is working properly. Navigate back to the rule that was just created. Within the Properties	panel under Rule Type	select Data Return Rule (Single). Beneath Output Type	chose Account. With Data Return Rule (Single) the options for Result	and Else	change to Outcome Data[True/False]. Solely for example purposes chose the admin@decisions.com account for the True outcome path and the designer@decisions.com account for the False outcome path. Save and Close the rule designer. Debug the flow containing the rule. Type 4 has the Experience input, then run the debugger. This time the admin account is being output.